• Simultaneously removes scratches and leaves a high shine on dental appliances. • No need for pumice. • Available in an 80 gram jar. 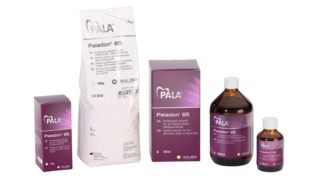 The classic solution for the press and pack technique: Paladon 65 is today's advanced version of the well known Paladon, our first heat curing denture acrylic.